Your excursion begins on a scenic 25 minute drive out of downtown Ketchikan to Knudson Cove, an "off the beaten track" waterfront property in the Tongass National Forest-your playground for the next 2 hours. 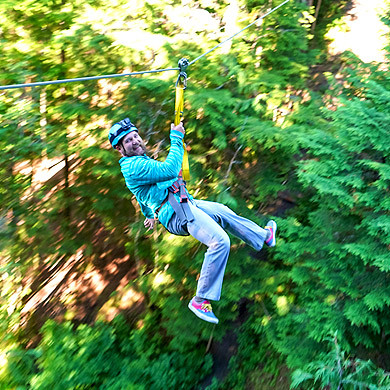 The park includes eight ziplines and eight unique aerial traverses which make this tour a diverse and interactive zipline experience. 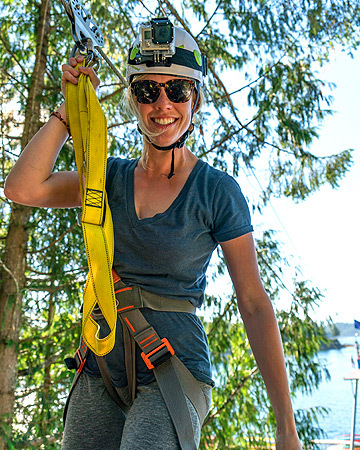 Before you begin your adventure, professional guides will instruct and outfit you with the best safety equipment in an open air forest pavilion. 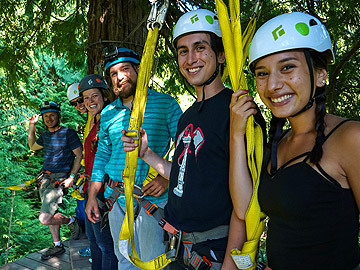 After ground instruction, your adventure begins as gravity pulls you along a series of eight ziplines and eight connecting elements. 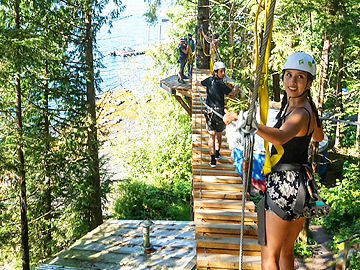 You will catch glimpses of bald eagles and the ocean below as you glide through old growth cedars, fly into an ancient cedar tree onto the Eagle's Nest Platform, traverse a swaying log, swing across rope loops, feel the speed and acceleration of landing onto an ocean platform located 50' over the water, and the rush of zipping to a soft forest floor landing. Then head over to the optional 50-foot climbing tower where guides will show you techniques needed to climb to the top. A circular staircase inside the tower enables others to climb up, take in the mountain and ocean views, and snap photos of climbers proudly ringing the bell at the top of the wall. Don't worry! These ziplines are easy. There is no hand braking. For the less adventurous members of your party, guides can assist you to skip elements. After your adventure, if time allows, visit the small store. T shirts, hats and soft drinks are there. Notes for booking the tour: Participants are required to read and sign a liability form. Those under 18 must be accompanied by an adult. Dress in light layers with flexible closed toe shoes. We also don't recommend the tour for pregnant women and those who have back, neck or spinal issues. No experience is necessary. "Family with 2 adult children - Excellent mid August day - first time for all as part of a ShoreTrips excursion. Timely pickup & drop off in Ketchikan. Personable and helpful guides, Trevin & Rainy. Appreciated your explanations on the safety procedures and assistance running the course. Trevin's tip on using the phone camera and Rainy's photography skill documented the fun. The zipping through the tree tops is enchanting. Enjoyed the over the lake run. Forever family memories." 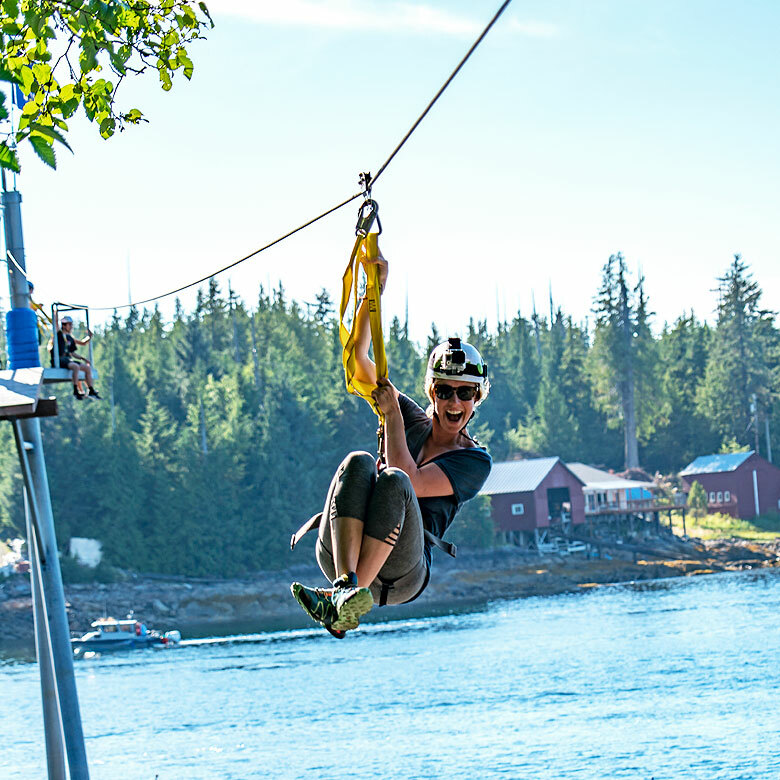 "We are seasoned zipliners, but our son and his new wife were newbies. Brad and Mikey made it a wonderful experience for all of us. I highly recommend this company. Their gear is top notch and their guides are very professional yet fun. We saw a mama bear and her cub searching for food, and the guides allowed us time to get some good photos of them. This is a "must do" excursion in this beautiful country." "We were in AK for a family trip...we are the grandparents of the clan. We decided to go for the zip-line experience and are we happy we did! It was super-safe and fantastic fun, mostly due to the professionalism and care of Tyler and Megan: our expert guides. They explained and demonstrated the gear and the process so well...they quelled our fears. We were able to relax and have a blast. At the ages of 73 and 75, we fulfilled an important item on our bucket list. Thanks, Tyler and Megan!"